Many of us are so familiar with this story that we may miss its significance. What Jesus was doing here was not just a nice little gesture with some pleasant symbolism attached. It was actually shocking, almost scandalous. What He did would be kind of like having your boss and her husband over for dinner and noticing her quietly taking out the overflowing garbage pail. Or like if your child threw up in church and the pastor came to clean it up. Sort of like that. Foot washing was something the disciples considered to be beneath them. How much more was it beneath their Master, Jesus! Yet Jesus did it. In fact He insisted on doing it. He was making a point. Might His point have been something like this? Ministry in My Kingdom isn’t always glamorous. It isn’t always fun. If you’re doing it for admiration and recognition, forget it! Kingdom work means serving people. And serving people gets messy. Sometimes there are bad smells; often you get dirty in the process. Many times you’ll end up exhausted. But serving others—even in the most menial, degrading ways, is not beneath you. Not if You’re truly My servant, anyhow, because it’s not beneath Me. Ask the Holy Spirit to search your heart and help you see why you do ministry. Is it for the joy of it? For the sake of helping someone else see Jesus? Does compassion motivate you? Or is service an obligation? Something you do to avoid the disappointment or disapproval of others. Are you motivated by the thanks and recognition you might get later? Would you serve if you knew no one else would ever know about it? If you consider some forms of service to be beneath you, ask Jesus to forgive you for that attitude and to change your heart. Or if you serve others for the recognition you’ll receive, ask forgiveness for that, too. Then ask Him to fill you with His humble confidence and selfless love so that you can serve others in the same way He did. Ask Him to show you one way you can do that today. And, with His help, do it! Knowing who we are and what we are to be about brings a huge sense of security. Do you think Jesus was secure in His identity? If so, what do you think may have contributed to that sense of security? What difference do you think His security made in how He experienced life? God’s Word declares that certain things are true of you, if you know Jesus. Read the following list (not comprehensive by any means!) of “I am” statements that describe how you see yourself. Put a + by any that you know (in your head, at least) are true of you. Put an * by any that you don’t feel very confident about, even though you may intellectually believe them to be true. Talk to God about your answers. Ask Him to help you believe at a heart-and gut-level the things He says are true about you. If there is one statement that is especially hard for you to believe and feel, consider memorizing the verse that corresponds to it. In this way, you can feed your faith. Money was not the only thing that motivated Judas in his decision to betray Jesus. But apparently it was a factor. For the right price, he’d be willing to hand Jesus over. The chief priests offered that price and the deal was sealed. Our checkbooks (or credit card statements) reveal a lot about our spiritual lives. For this prayer experience, find a recent bank or credit card statement. Lay your hand on it and pray, asking God to help you to see what is recorded there through His eyes. Then slowly, prayerfully consider each expenditure. What does each one say about what is important to you? Is there anything you noticed that you would like to change? Is there anything you need to confess? Is there anything that gives you joy? Tell the Lord about it. Where you wish to change, ask for His help—spending habits are a matter of the heart, and heart transformation is not possible on our own. We need the Holy Spirit’s help—which He is only too glad to offer. Then ask God to show you one step you can take this coming week to use money in a way that reflects His life in you. Don’t be surprised if you experience joy, peace, freedom—or all of these—as you follow through. That is the way it works in God’s kingdom. Do you hear the longing in Jesus’ words? His heart doesn’t just go out to people who get it all right, model students, perfect children— His heart goes out to the prodigals, the rebels, the ones who would spit in their own fathers’ faces. But even though Jerusalem has rejected God’s repeated overtures of love toward her, even though she has killed God’s messengers of peace, even though Jerusalem will in a few days abuse and murder Him, too, Jesus longs to embrace these wayward ones. He loves them. He wants to be near them. He wants to draw them under His wings so they can experience His love and care for them. Just like a mother bird cares for and protects her chicks. Do you ever feel as if God couldn’t love you? That you just don’t have your act together enough for Him to want to be around you? Well, that’s not at all how He feels. Whether you’ve had a good or bad day, whether you’ve lived a good life or a bad one, He yearns for you. 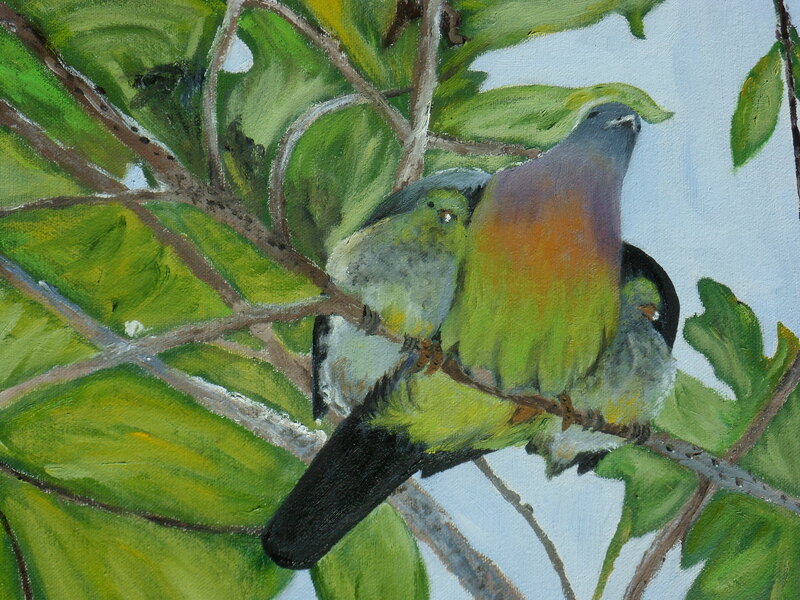 Let this image of tiny birds tucked under their mother’s wings guide you into reflection about God’s love and longing. What would it feel like to be a baby bird under its mother’s protection? Can you let your soul draw near to Jesus so you can experience His gentle strength and faithful love? Spend a few minutes silently enjoying His love and protection. Then tell Him whatever is on your heart. Sometimes it is hard to understand why the King of kings and Lord of lords would weep over any human situation. He’s sovereign and all-powerful. He created and sustains the universe. Why would anything move Him? Why doesn’t He just make the pain and brokenness go away? Theologians have long debated that question—but the most simple, honest answer might be, “We really don’t know.” What we do know and would do well to take to heart is that Jesus was moved. He saw and experienced things that broke His heart, things that moved Him to compassion and prayer. And as we seek to become more like Jesus and to represent Jesus well to the world around us, we too, might find our hearts broken from time to time. What person, situation, city, or nation, breaks your heart? Do you ever weep over it? Tears can be prayer. If you find yourself moved over something, don’t ignore or stuff it. God may be inviting you to weep with Him. So invite God into it and let it become a holy moment of shared sorrow. What if nothing breaks your heart? It could be that your own heart has been broken and has become calloused in order to protect it from further pain. Ask Jesus to show you His compassion for you—ask Him to heal the brokenness and make your heart tender again. In any case, try to take in the astonishing fact that Jesus, very God of very God, wept. He was moved with compassion—for Jerusalem, for the world, for you. If you can, enjoy some time in nature today. If you can get outdoors, do so. If not, maybe you can see a sunrise or sunset from your window. Nature photographs or a nature documentary are other options. Or maybe you have brought nature into your home or office—plants, pets, rocks, seashells, etc. Whether indoors or out, choose some element of nature to focus on. Realize that God intentionally made whatever you have chosen to look at. The Master Artist specifically chose to create this particular expression of nature. Why do you think He did so? What does this piece of creation say about Him? How does it, in its own unique way offer Him praise? Let your time with God’s masterpiece inspire your own praise of Jesus, Lord of Creation. Don’t be outdone by a rock—worship Jesus with gladness and joy! Lent invites us to align ourselves more closely with the life and call of Jesus, and confess and repent of those areas in which we fall short. However, the Sundays that fall in the middle of this season traditionally are exempt from these more sober reflections. Instead, they are celebrated as “mini-Easters”—appetizers, if you will, of the resurrection hope toward which Jesus’ resurrection points us. Think back over the different meditations you’ve done this week. What transformation have you been invited to? Now think about the body of believers at your church. What if each person were to be transformed according to the challenges Jesus is putting forth? What would your church look like? Now, stretch even further: Think about the body of believers around the world. What would the world look like if every Christian willingly let the Holy Spirit transform him or her to resemble Jesus in the ways we’ve considered this week? How different would the world be? Read Isaiah 2:2-5 slowly and prayerfully. Try to picture the scenes and events in your mind’s eye. Try to feel it with your heart. Read it several times to allow the pictures and feelings to crystallize for you. What longings are stirred? What gives you hope? How can this vision encourage you as you continue your Lenten Journey with Jesus? Pray about what you are seeing, thinking, and feeling. And give God thanks that one day this is in fact how it will be.